Look below for replacement Sensation belts for your Sensation outdoor power equipment. Use our lawn mower belts cross reference tools to the left to find your belt by size. 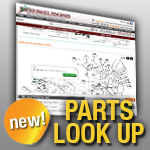 At Jack’s we want you to be able to get your lawn mower parts quickly and easily.